Located opposite the Manchester Art Gallery the award-winning Princess St Hotel hotel is ideally located for whatever your stay may require. In Manchester city centre the Grade II Listed Princess St. The hotel has a 24-hour fitness centre and modern rooms which are all furnished to the highest standard with comfy beds flat screen TV power showers FREE WiFi access air-conditioning mini fridges irons and safes with extra touches such as heated mirrors and bathroom speakers. 24 Bar & Grill serves award-winning cocktails and snacks while the restaurant offers a modern British menu created using the produce of some of the finest and most respected farmers and butchers of natural beef in the British Isles. This beef is the headline feature of the 24 Bar & Grill menu meltingly tender the beef is aged for a minimum of 28 days and selected from prime cuts. If you would rather stay in the comfort of your own room the hotel also offers a 24 hour service menu. The 24 hour fitness centre is equipped with treadmills cycling machines and step machines with free weights and is free for all guests of the hotel. 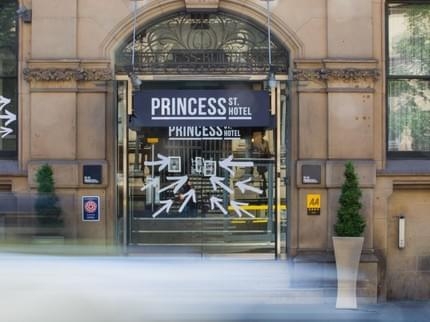 Situated on Princess Street The Princess St. Hotel hotel is 2 minutes walk from a metrolink tram stop with Manchester s central shopping district only a 3-minute walk away. Piccadilly Rail Station is a 10-minute walk away and within easy reach are Manchester Arena Manchester Central and Arndale shopping centre. Old Trafford and the Etihad Stadium are nearby. The Famous Manchester Christmas Markets are only a 3 minute walk away. The easiest way to find the hotel if you are driving is to put the postcode into your satnav. The hotel is easy to find from the M6/M61/M62/M602. Please note that parking is not provided at the Arora Hotel but offers a concessionary rate for guests at Q Parks Piazza on St James Street (take the second right past the hotel). If you are travelling by train the two closest stations are Piccadilly and Oxford Road (a 10 and 7 minute walk respectively).